A Forno Bravo wood fired pizza oven is considered a “black oven” which means the firewood you use is in the oven chamber where your food is cooked. You want to avoid using anything that will release hazardous chemicals into your food, make it hard to keep your temperature consistent, or leave a soot and creosote buildup that presents a fire hazard. The best woods to burn in your Forno Bravo pizza oven are dry, seasoned hardwoods such as oak, maple, ash, beech, and birch. Oak is probably the safest, is easy to source, and burns very hot compared to other woods. Hardwoods can weigh up to three times as much as softwoods, so they give off more heat (BTU’s) for the volume. Fruitwoods are also extremely popular, including apple, almond, cherry, hickory, pear, and pecan. Another advantage of fruitwoods is their fragrance. Some of the best-known wood fired pizzerias swear by apple wood because it burns very hot, and has a great aroma and flavor. If you choose to use a softwood, ensure you properly cure and season it to reduce sap content. Also, removing the bark will help reduce the moisture and sap content. Woodchips and wood pellets can be used as kindling and fuel provided they fit the untreated conditions set forth below. However, they will typically not produce the same amount of BTU’s as firewood, so they probably won’t work as the sole woodfuel source in your pizza oven. Choosing the right wood for your pizza oven will depend on where you live. Please be responsible and only buy local wood; do not transport wood from other regions. Transporting firewood often means transporting bugs, pests, and non-native species with it, spreading disease between areas. There are also some great resources about firewood on university and state-sponsored websites that can help you make your choices. Cutting or collecting firewood on National Forest Service or Bureau of Land Management (BLM) lands requires an easy to obtain permit directly from the agency in question. Never burn laminated woods like plywood (or particle board), pressure treated woods or anything painted or chemically treated or glued. You can use untreated pallets and construction lumber scrap for kindling to get your firewood going. If you aren’t sure if the wood has been treated chemically: “when in doubt, throw it out.” You don’t want these toxins in the air or in your food. Charcoal should not be used in your home pizza oven. One reason not to use charcoal is that it produces more carbon monoxide than firewood. Since carbon monoxide is undetectable without special equipment, it is a safety issue. Also, despite charcoal burning hotter than firewood, it doesn’t transfer that heat as efficiently inside the oven. Brick ovens get heat in three ways, flame refraction off the dome, thermal equilibrium, and hot coal transfer. Because charcoal doesn’t produce a direct flame, you lose one of the sources of heat in a brick oven. Using charcoal in your Forno Bravo oven can void the warranty and present safety risks. Avoid resinous woods with high sap or oil contents, like red pine. This type of firewood will leave excessive soot, coating the pizza oven and chimney flue with creosote. You can burn it off with a hotter / clean burning firewood like oak. While you can handle most routine oven cleaning, it’s a good idea to hire a certified chimney sweep at least once or twice yearly (more often depending on the frequency of use). Some woods that fit into the sappy or oily category are pine, fir, eucalyptus, white birch, and cedar. However, if you decide to use some oily woods for flavor remove the resinous bark to reduce moisture and sap content. A freshly cut tree, or “green wood,” is similar to a sponge that has been presoaked in water; it has to be dried out, or “seasoned,” before it can be used. Firewood should have a moisture content around 20%. Look at your wood. If the cut ends of the firewood have darkened (turned grey) with small radial cracks, it means the wood is dry and ready to use. A moisture content lower than 15% is actually too dry for use in wood fired ovens. Overly dry wood will convert heat energy to smoke and creosote on a bed of hot coals. Wet or damp wood will burn poorly and also produce a lot of smoke. If your wood is green, it is most likely uncured, will burn poorly and produce a lot of smoke. This will cause soot and creosote build up, and it will not burn very hot. We suggest you invest in a wood moisture gauge if you can’t find a reliable source, or if you harvest your own wood. You will want to harvest or buy firewood in early spring or late winter, if possible, so it has the summer to dry out. Wood will not begin to season until it’s been prepared to dry out in a proper woodpile. The drying time depends on the wood type; some hardwoods require a year or two to dry to the desired 20% moisture levels, while some softwoods only take 6 to 8 months. If you have sufficient storage room, try to purchase wood a cord at a time. A cord is a stack of wood four feet wide, four feet high and eight feet long (4’x4’x8’). Be careful, as many people have been ripped off by un-reputable foresters looking to make a quick buck. For a quick summary of what a cord of wood is, click here. For a more detailed explanation on measuring a cord and how to stack wood, click here. If you cut your own firewood, try to do it in the off-season, when the sap is in the roots. Wood should be given about six months to a year to dry properly. You will know it’s ready when the cut ends have darkened, and a series of “checks’ or cracks have appeared across the ends. Split wood dries faster than rounds, catches fire faster, and burns brighter in the oven. As a general rule, the wood you burn should be no larger than 3″ in diameter and around 12-18 inches long. Kindling is cut into smaller pieces. Do not use bark, needled pine twigs, or leaves for kindling; they are too resinous and smoky. If you do leave the bark on the wood because you want more smoke, than we suggest you turn the bark up with the exposed wood below, this will help it catch fire and burn better in the oven. Avoid “over-firing” your oven. If flames are coming out of the oven mouth, you are using way too much wood! Also, do not fully close the oven door when wood is burning inside. This can cause the fire to flare up when the door is removed, causing serious injury to you, and possible damage to your oven. If you are stuck with a load of damp wood, or your wood has been rained on, there is one trick to help dry it out. Each time you are finished cooking with your oven, place the next day’s wood inside the oven. Doing this will bake out the moisture using the previous fire’s retained heat. Even if you are doing low heat cooking overnight, you can still dry your next load of wood the next day. It really works. Be sure to leave the oven door open slightly to let any gasses and steam escape from the oven chamber. We recommend you build your foundation 2” to 3” above ground to prevent rain from getting the firewood stored under your pizza oven wet. You can store some wood below your oven, but the size is somewhat restricted, and it might be best reserved for kindling and your wood supply for the next few firings. If you purchase a Forno Bravo Cucina stand, it provides wood storage below the pizza oven’s hearth. If you own a Primavera or Napolino outdoor pizza oven, we sell water-resistant covers in our online store. 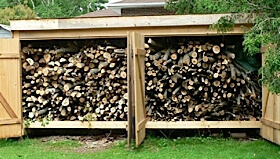 If you have room, build a woodshed to store your split wood. An effective woodshed has a waterproof roof and a raised floor with gaps for sufficient airflow. If your wood should be rained on, or otherwise dampened, you can place it in your oven with the door slightly ajar after you are finished cooking and it should be sufficiently dry for use the following day. As always, another great resource is the Forno Bravo community Forum, with over 26,000 users worldwide with brick ovens, if you are looking for a great local wood source, why not ask someone who has already done the research in your area?